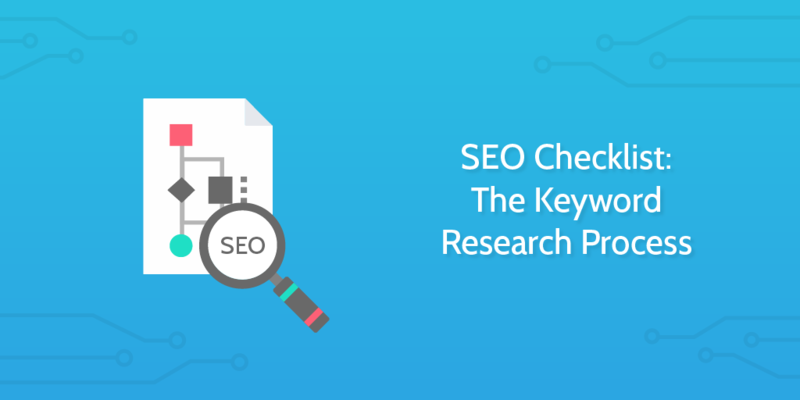 Run this checklist to refine and select the keywords that will help you maximize your SEO. Keyword mastery is an art; the steering force behind your SEO campaigns. It dictates the content you write, the marketing strategies you deploy, and is a crucial component in enabling the success of your business. Keywords also help you to understand the needs and desires of your target audience, providing back-doors into high-traffic SERP rankings and offering a variety of competitive vantage points. It's clear that keywords are important. Why, then, is so little emphasis put on the keyword research process? You wouldn't run a targeted Facebook ad campaign based on a gut feeling, so why skimp on such an important part of your SEO strategy? This checklist runs through a robust process for keyword research, that you can use, re-use, and modify for your own specific needs; by the end of this checklist, you'll have covered all of the most important aspects of any good keyword research process. First, you'll need to pull together some keywords that roughly define what you're trying to target. These initial keywords serve as a starting point for your research and help define your niche and the needs of your target demographic. Think about your intent. If you're promoting a product or business online, then you need to put yourself in the buyer's shoes. What might they search for to try and solve the problem that your product is solving? Brainstorm all the ways that people might search for your product, or how you would describe it in your own words. Remember, this is just a starting point; record your results in the form fields below. 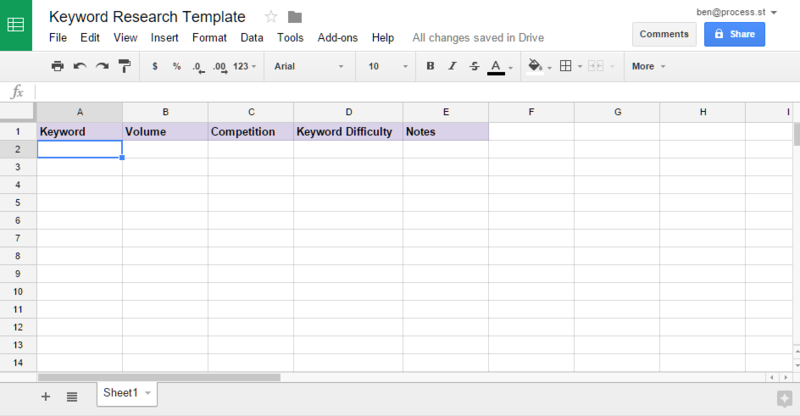 If you're not using a keyword database, head on over to Google Sheets and create a fresh template to store your keywords. You can use the blank template provided here, or download the Excel file below. Use the initial keywords you gathered in the previous task to springboard onto researching and building a list of related keywords. There are endless ways to research for related keywords, but this task lists some of the most tried and tested. For example, Ahrefs is a leader in keyword research tools, and their Keywords Explorer is a great way to dig for related keywords that aren't simply exact phrase matches. Input your initial keyword(s) into the Keyword Explorer and asses the results. You could also use a keyword research tool like Soovle, UberSuggest, or AnswerThePublic. Some of the keywords that you find with these methods will just be obvious variations, but some are related topics and others different keywords altogether. Try all the methods listed here and flesh out your master list of related keywords. After researching, make sure to add all relevant discoveries to your database. 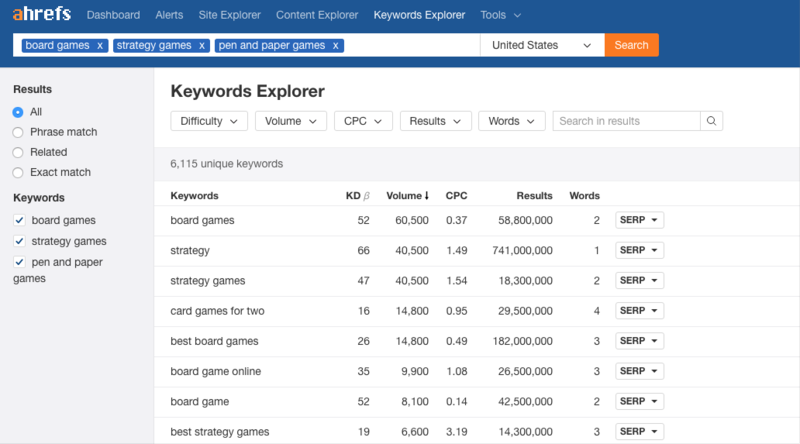 For keywords discovered through organic social channels like Reddit, Facebook groups, or Quora, run them through the Keywords Explorer tool to get some metrics you can record, for use in sorting them all later. Primarily, you want to be looking for the keywords with the highest search volume, but that is just one piece of the puzzle. Keywords and exact keyword phrases with high search volumes tell us a few things. 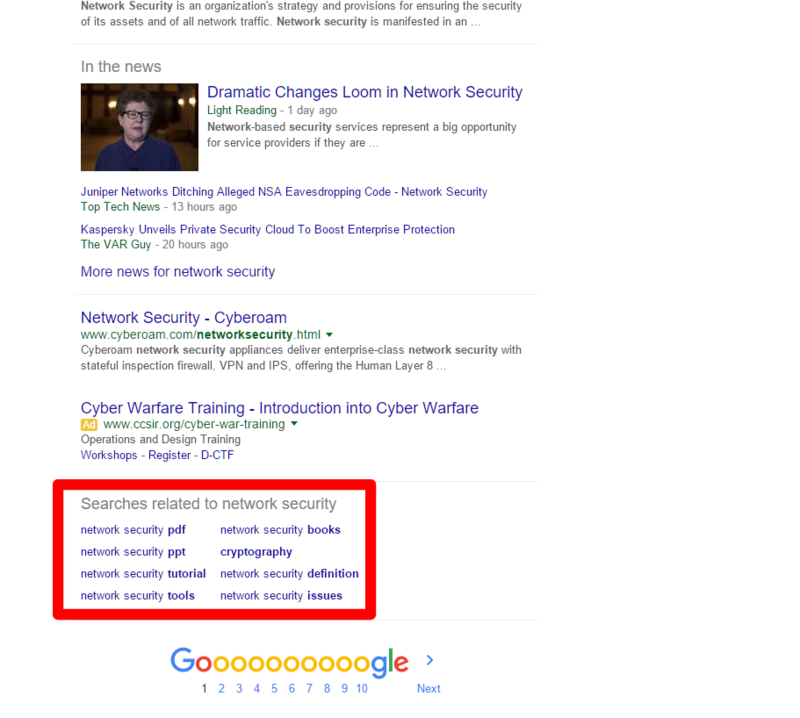 Namely, that there is currently a high demand for something about this keyword - whether that's a consumer demand for a product or a more general demand for information on a topic. High volume keywords also indicate the immediate language that people are currently using to try and satisfy their needs. But that's not all you have to consider; checking on the number of clicks that a certain search term gets helps to distinguish between informational and commercial intent. Basically, there's a lot to consider. Use the sub-checklist below to filter your related keywords and weed out the poor fits. You should consider your needs and business goals, as well as the resources you have available for SEO. Once you've applied a few filters and considered the results, select the best fit keywords and add them to your master keyword database. Keyword optimization is about ROI at the end of the day. Your challenge is to figure out what business intent you should be looking for in a keyword. For example, if you want to drive traffic and grow brand awareness, then keywords with high volume will be good for you, regardless of their click rates. Commercial value doesn't simply equate to a number of conversions. It depends on your business strategy, and how the keyword plays a part in that. A big part of deciding if a keyword is worth targeting is looking who is already ranking for that term. If you find that hugely popular and authoritative sites are ranking for your target term, you're in for a tough time. A quick way to judge how difficult it would be to rank for a keyword again uses the Ahrefs Keywords Explorer. Pages with a low PR or DR (less than 30), or a low backlink count, are prime for overtaking. By writing better content, optimizing it properly and building quality links, you could knock an inferior page off of the top spots. High keyword difficulty is not necessarily a reason to give up on a keyword. It all depends on the balance between what business value the keyword offers versus its ranking difficulty. One web page can rank for thousands of extremely tightly related keywords, so it makes sense to filter down these pages to the highest ranking ones. By looking at what competitor pages are ranking highly for certain keywords, you can effectively reverse-engineer this ranking indicator to find new related keywords. Ahrefs Site Explorer once again proves its worth us with a powerful tool to access this information. Look for more keywords in your less-than-specific niches, and keep in mind everything from the previous two tasks (keyword difficulty, volume, clicks, and how they all fit into your business plan). It's easy to forget that keywords are essentially the missing link between you and your customers. Good keyword research understands that keywords represent the needs and desires of your customers. If you can get behind that, then you will surely understand the importance of communicating to your audience asking for their feedback. Check the template mail below and hit "Send" after filling in your email list in the "To" field. Alternately, you could just copy the email contents into your own mass mailing tool. An ideal response to this kind of question is absolutely crammed with insights into the customer's mind. Not only does it tell you all about their goals and pain points, this kind of mini-testimonial also serves us up some of the organic language your customers use to try and define a solution to their problem. With these gems, you can build better products and target better keywords. There are a few ways to search for long tail keywords. Another way is by looking at social channels where real people communicate. Choose places that are related to your niches, such as specialized forums or social groups. Quora is also a great place to investigate because the format of question-and-answer is the perfect place for organic keywords to sprout up. You can use LSIGraph for generating semantically related keywords. Add the top five to your keyword database and mark the tasks in the sub-checklist below as complete. Keyword intent helps you to understand the intent the user has when they're searching for a particular keyword. It's a window into their state of mind as they're trying to solve a problem (like a question they want to find the answer to, or a product they want to make a decision about). Consider the intent behind the current list of keywords. Informational keywords are typically far more difficult to convert than transactional or even navigational. What you're looking for will depend on your needs. Finally, after all of your research, gathering, and pruning, it's time to make a decision. Round up the top keyword along with the four most appropriate related keywords, and record them in the form fields below.